Adventureland is one of the "themed lands" at the many Disneyland-style theme parks run by the Walt Disney Company around the world. It is themed to resemble the remote jungles in Africa, Asia, South America, and the South Pacific. "To create a land that would make this dream reality", said Walt Disney, "We pictured ourselves far from civilization, in the remote jungles of Asia and Africa." Adventureland provides a 1950s view of exotic adventure, capitalizing on the post-war Tiki craze. Lush vegetation resembles jungles while elements of the "other" surround the visitor. Tribal performance masks, conga drums, non-American totem poles, exotic animal statues, and architecture of Pacific influence make for a confined area wherein industry and technology take a back seat to uncharted nature. Noted art historian David T. Doris explains Adventureland as, "a pastiche of imaginary colonial spaces, conflated within the green and foliate milieu of "the Jungle." 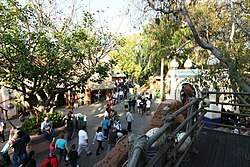 Disneyland's Adventureland was originally envisioned as True-Life Adventureland, and was to be based on Walt's famous award winning nature documentaries on Africa and Asia. The land was originally supposed to have real animals from Africa to inhabit a jungle river, but after zoologists told Walt the real animals would lie around or hide, the imagineers built mechanical animals instead. Adventureland opened with the Jungle Cruise as its star attraction, until the Swiss Family Treehouse was added years later. With the groundbreaking technology of audio animatronics Walt Disney's Enchanted Tiki Room was added nearby the land's entry bridge. Oceanic Arts also created the series of tribal masks that now line the entry bridge. Many years later Indiana Jones Adventure was added with the expansion of Adventureland and gave the entire land a 1930s theme, which concurs with the setting created by the rustic boats of the Jungle Cruise and its DJ Albert Awol who plays big band music from the 1930s. In 1999, the Swiss Family Treehouse was transformed into Tarzan's Treehouse. Adventureland has remained the same since, until 2008 with the former summer event, Indiana Jones Summer of Hidden Mysteries. The Adventureland at Walt Disney World is divided into two main sub-areas, one being the Arabian Village and the other one being Caribbean Plaza, which is home to Pirates of the Caribbean. The original Polynesian motif is still visible with the prominence of jungle surrounding the Swiss Family Treehouse and Walt Disney's Enchanted Tiki Room. The 1930s adventurer/explorer vibe is clear with the background music heard over loud projecting speakers recently installed throughout Adventureland with a different vibe than that of Disneyland's, but with similar Big Band music and witty announcements. The Magic Carpets of Aladdin attraction was unique to this version of Adventureland before the opening of Tokyo DisneySea and Walt Disney Studios Park in Paris. While the House of Treasure opened originally when the Pirates premiered in December 1973, it started fully operating in February 1974 according to a March 1974 issue of "Eyes and Ears", a cast member newsletter for Walt Disney World. Tokyo Disneyland's Adventureland is a mish-mash of the various Adventureland interpretations. It features a unique ride - the Western River Railroad - and a different version of Walt Disney's Enchanted Tiki Room, minus the Walt Disney tag, with a more Hawaiian feel. It features a pair of sub-lands: The Typhoon Lagoon inspired Coral Landing near the Swiss Family Treehouse and another one based on New Orleans Square at Disneyland, which features Pirates of the Caribbean. World Bazaar's buildings fade into New Orleans. The first, known as Adventureland Bazar, is a recreation of an oriental city from the 1001 Arabian Nights, presumably Agrabah from the Disney movie Aladdin (Imagineers were designing the entrance area of this Adventureland while the film was in production). In 1993, the attraction Le Passage Enchanté d'Aladdin opened in this very area. The concept of this city eventually reached overseas resorts. The second part of Adventureland has a more African appearance, and is mainly composed of shops and restaurants (like the Hakuna Matata Restaurant). A third themed area represents Asian mysterious jungles. Themed to explorers. The last part, and the biggest, is a Caribbean area, covering most of the surface of Adventureland. It features the ride Pirates of the Caribbean and Adventure Isle, a Tom Sawyer Island-like walkthrough spot, with some attractions like Swiss Family Treehouse or Captain Hook's Pirate Ship. This Adventureland presented some construction problems, mainly due to the unsuitable local climate. Growing exotic jungles in a place where winters could be harsh was a tough task. This is also the reason why there is no Jungle Cruise ride, since most animatronics animals would have been exposed to this weather. However, abandoned ideas intended to build an adequate ride under a glass roof, but that never came true. There is no Tiki Room attraction either, although the Explorers Club Restaurant (now Colonel Hathi's Outpost) features animatronics birds that used to sing. Hong Kong Disneyland's Adventureland is the biggest among all Disney parks and features a large island area home to Tarzan's Treehouse, which is circled by the Jungle Cruise, not much like the Rivers of America in most Magic Kingdom–style parks' Adventureland area. It is also home to the "Festival of the Lion King" show. In early May to August 2007, the land was converted into Pirateland, in conjunction with the release of the film Pirates of the Caribbean: At World's End. The outer edge of the land was under construction from early May to September 2008, adjacent to Festival of The Lion King. A temporary structure was built for Demon Jungle, an exclusive attraction for the 2008–2010 Halloween seasons, and transformed to The Revenge of the Headless Horseman for the 2011–2014 Halloween seasons; it is now home to introduced its all-new “Black Box” space" known as "The Pavilion", a flexible event venue. Unlike the other parks, there is still no Pirates of the Caribbean at this location yet. On September 1, 2017, the area around the bridge that near the entrance of the theme land and in front of Tahitian Terence has surround by fences hiding the works starting recently for "Moana: A Homecoming Celebration" opening on 2018, as part of its multiyear expansion plan for the Park since November 22, 2016. Shanghai Disneyland Park features an area similar to the "Adventurelands" found at other Disney parks, named Adventure Isle. Just like "Adventureland" at Disneyland Paris, "Adventure Isle" does not include a Jungle Cruise attraction, and instead features a ropes course called "Camp Discovery", a dinosaur-themed rapids attraction named "Roaring Rapids and Soaring Over the Horizon. The land's story focuses around a group called the League of Adventurers, who came upon the island after their airship was driven off course in the 1930s. Befriending the native Arbori tribe, they have been engaged in studying their culture and the island ever since. Each attraction is tied to a Guardian Animal in the Arbori mythology: Roaring Rapids is the realm of Q'aráq; a giant crocodilian Guardian of Water, Soaring Over the Horizon is located in a celestial temple to Q'otar; a condor spirit of the air, and Camp Discovery lies in the realm of Q'ai; the fanged cat guardian of the earth. In the Epic Mickey series, Wasteland's version of Adventureland is Ventureland. Its main elements is the movie Peter Pan and the Pirates of the Caribbean attraction. ^ Jim Fanning (2009). Disneyland Challenge. Disney Editions. p. 13. ISBN 978-1-4231-0675-3. ^ Foxxfur (2018-04-20). "Passport to Dreams Old & New: The Forgotten Shops of Adventureland". Passport to Dreams Old & New. Retrieved 2018-08-30. ^ Barnes, Brooks (November 22, 2016). "Hong Kong Disneyland, Seeking Return to Profit, Plans $1.4 Billion Upgrade". The New York Times. Retrieved November 23, 2016. ^ Miller, Daniel (November 22, 2016). "Hong Kong Disneyland in line for a $1.4-billion expansion, adding a 'Frozen' themed land in a bid to boost growth". Los Angeles Times. Retrieved November 23, 2016. ^ "Hong Kong Disneyland Set for Multi-Year Transformation with All-New Attractions and Entertainment". news-en.hongkongdisneyland.com. Hong Kong Disneyland Resort. Retrieved 22 November 2016. ^ "Multi-Year Expansion of Hong Kong Disneyland Announced by The Walt Disney Company and Hong Kong Government". www.edmontonjournal.com. CNW Group. Retrieved 22 November 2016. ^ Ng, Ellie (22 November 2016). "Disneyland to receive HK$5.8 billion in gov't funds to expand park". Hong Kong Free Press.